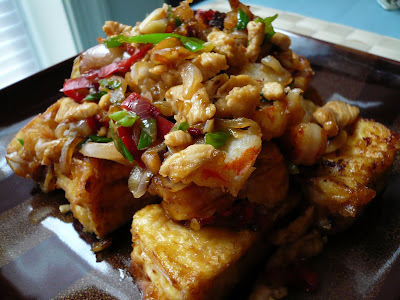 I remember eating this tofu dish a long time ago at one of the Chinese restaurant near my office. Is simple yet really delicious. They added salted fish to it but I can't because Carlos and the neighbour might call the police on me because of the smell :) I normally don't deep fry my tofu because it spatter a lot but for this dish I made the exception. So here the simple version of it. 1) Heat up oil, cut tofu to bite size pieces and coat the tofu with cornstarch and fry tofu till golden brown. Drain on paper towel and set aside. Pour out the oil and leave about 2 tbsp. 2) Heat up oil and saute shallots, garlic and chili until lightly brown and fragrant. 3) Add in chicken and prawns and stir-fried until it changes color. 4) Add in oyster sauce, fish sauce, sugar and little bit of water. Stir-fried for a few second and add in the tofu. Mix well. 5) Add in a few splash of Chinese cooking wine and stir-fried for a few second and add in the spring onions. Dish out and serve warm with rice. Note : You can add more water if you like gravy. I like mine dry so I just add 3 tbsp of water to it. I didn't add any salt because the fish sauce is already salty. Looks tasty, I think I'll have to try some tofu. I tagged you over at my blog, hope you don't mind. ooooh!! ada stinking tofu ,ada fragnant tofu pulak! !.Hmmmm..your "heong tofu" look shinning and crisp.I have plenty of soft tofu in fridge now,maybe I should cook some for Mishu.Thanks for sharing! Siapa crescenet? Must be some kind of spam. Nice looking tofu...I can smell it all the way from here!!! 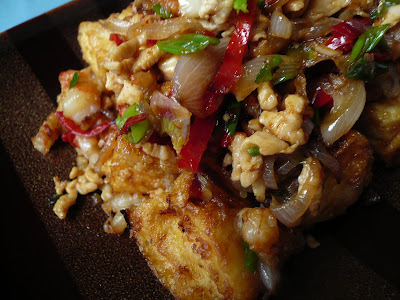 Yeh, another good tofu recipe. Will add in the delicious salted fish no matter what. Come and bail me out if I kena lock-up ya, kekeke. Pinky, I kena spam :( It really smell good. Choy, yeah I am sure it will taste even better with salted fish. Ok I go and bail you out :) :) So when are you going for the dimsum and bak chang? tofu! i love tofu! so funny, fry salted fish they'd call the police? hehehe.. are you a big fan of salted fish tho gert? Oh yes, I remember this dish too... Minced meat with fried tofu cooked in dark sauce... Almost like claypot tofu, right? Cat, yeah is something like claypot tofu but this dish is dry. Wah the tofu look nice ah. But frying the tofu wont mah fun meh? Anyway, check out my blog got something for you. I had fragrant tofu 2 weeks ago in Singapore, and I'm still raving about it.Y our recipe is the closest to what I tasted. I still remember the tofu having the texture of creme brulee, aaarghh, delicious. I am definitely going to try your recipe!! Christelle, I love tofu too but I never think of it having the texture of creame brulee ha ha.